Written initially for Sassi Sam and reproduced here. On a small road outside Dublin, a tired truck driver swerves to miss a deer, causing his truck to ram into one car and another to roll into a ditch. One driver dies and the other escapes miraculously with little more than scratches. This tragic accident sets in motion a chain of events that brings families together and uproots long-kept and damaging secrets. Lifesaving for Beginners is Ciara Geraghty’s fourth novel. It is told through two perspectives; that of nearly-forty year old, successful author Kat Kerrigan and Milo, a young boy who loves his lifesaving classes, his mother and banoffi. As engaging as the story is, the real enjoyment for the reader comes from the select cast of realism of Geraghty has gift for creating characters with comparatively few words but who come alive and whom you can believe and invest in as a reader. Principal protagonist, Kat Kerrigan, is not an instantly loveable character. She has spent her life concealing truths from the people who surround her, including herself. Only four people know that she is the anonymous author of internationally best-selling movie-making detective stories, and two of those people are her publishers. Kat is terrible at personal relationships, being secretive and selfish in the extreme. The only person in her life whom she loves unconditionally is her brother Ed, who has Downs Syndrome. Along with Milo, the second narrator, Ed is a delightful character who is portrayed with such sensitivity that you never feel sorry for him or his family but rather appreciate him as the person who brings out the best in Kat. Back when she was 15, something happened to Kat that she has never dealt with and which she has kept secret even from her family. By covering over and burying the past, she has changed profoundly into the prickly, ultra-private person she is now. The car accident that doesn’t kill her still acts like a bomb thrown into her life, bringing up the events of 20 years ago and causing Kat to embark on an indulgence of self-destructive behaviour. Milo, in contrast, is loveable and caring. His mother died in the car crash and he is left in the care of his sister Faith. As much as she tries to keep everything together for him, he feels keenly the loss of his normal, ordered life and of course, his loving mother. His young voice has been perfectly captured by Geraghty, making it so easy to fall for this small boy who is dealing with personal tragedy and family fallout with great maturity. Lifesaving for Beginners deals with death, privacy, secrets and trust in the closest relationships people can form – with family, partners and life-long friends. Geraghty has written an engaging and personal story told from the perspectives of two very different people; the instantly likeable Milo and the contentious Kat, whom you warm up to as she allows herself to grow and become accepting. 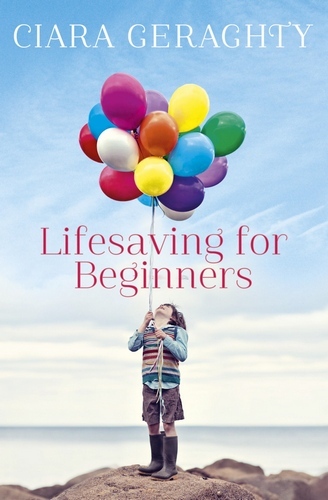 Though Lifesaving for Beginners may be what I call ‘aeroplane reading’; the light yet absorbing books you pick up in airport news agencies for plane journeys; it is so much more emotional and rich than what is called for by the genre. Geraghty is a delightful writer who sweeps you up in her characters and tells stories with hope and enjoyment and the very necessary hint of darkness. If you were to pick this book up for a flight to Europe, you wouldn’t put it down for the full 24 hours. I had the good fortune to meet and interview Ciara Geraghty for Sassi Sam. Read the full interview.